Diplomacy in EU4 is the system that involves all relations and actions with other nations. Relations can be increased through alliances, coalitions, common wars, common rivalries, decisions, events and having a diplomat improve relations. Relations are decreased by declaring war, being rivals, sending insults, having a different religion, breaking/dishonoring an alliance, events and decisions. Diplomacy is a bilateral system and will affect relations on both sides of an agreement. Reasons for a nation's opinion of another are displayed in tooltips wherever opinion is shown. The total is capped at +200/−200. Diplomacy is conducted by diplomats, and the diplomatic options available to diplomats depends on a country's technology and ideas. Diplomatic options are split in seven categories: alliance, influence, relations, dynastic, covert, economy and access. The emperor of the Holy Roman Empire has an extra category: Emperor actions. The Papal controller also has an extra category: Papal actions. The declare war and sue for peace diplomatic options are found outside of these categories. A diplomat is required to perform most diplomatic actions. Some actions - improving relations, annexing a vassal, building up a spy network and counterespionage - will occupy a diplomat indeifinitely or until completion of the task, unless the diplomat is manually recalled. Actions that will occupy a diplomat for a period of time will display a diplomat icon ( ) on their button. Other actions are immediate. When initiating a mission, a diplomat takes one day to reach the target country and begin its mission. After completing a mission, a diplomat will be unavailable while he travels back home, the time which scales based on the distance between one's capital and that of the target country. The precise travel speed of diplomats is 20 distance per day. With parliament and ‘Expand the Diplomatic Corps’ as active issue for 10 years. The number of other countries a nation can have diplomatic agreements with is limited. Each relation over the cap costs 1 diplomatic monarch point per month. The limit only counts for the number of different countries with whom an agreement has been closed, not the number of agreements. Having multiple agreements with a single nation only counts as one diplomatic relation. Having vassals who are members of the empire as the Holy Roman Emperor, if Revoke the Privilegia has been passed. Certain events may also give a temporary increase in the relations cap. A nation's diplomatic reputation represents its overall diplomatic ability and credibility. 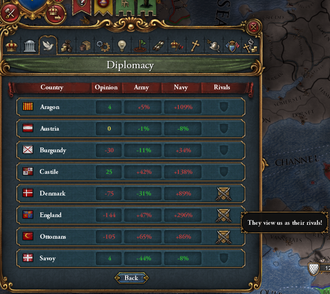 Diplomatic reputation is visible in the diplomacy window of the country screen. Diplomatic reputation positively affects both subject relations and relations with sovereign nations. Declaring war initiates a military conquest against the target country. A casus belli can be selected and the allies of both sides are shown in the declare war screen. Winning battles, achieving the wargoal, and occupying provinces accumulates war score for both parties, by which peace terms may be agreed upon. At war a country can offer a peace deal (sue for peace) or an unconditional surrender. A coalition is an alliance of nations who have bonded together against a common enemy because of this enemies' very high aggressive expansion. Coalitions members will automatically be offensively and defensively called to arms in any direct war between a coalition member and the coalition target. An alliance is a military agreement of mutual support in wars between two nations. The strength of an alliance is based on trust and favors with the alliance partner. Available only with the Conquest of Paradise DLC or the El Dorado DLC enabled. Nations may support the independence of a nation if the target nation is a subject nation and has a liberty desire of over 50%. If the target nation declares a war of independence, all nations supporting its independence will automatically ally the target nation and join the war against the former overlord of the now (temporarily) independent nation. A nation may rent out their armies to another nation in exchange for payment, while maintaining manual control of the army. A maximum of 20 regiments can be rented out simultaneously. Trade leagues are a group of small countries banded together to boost trade and provide defensive protection to each other. Only single province countries can join a trade league. A trade league must be lead by a Merchant republic or Veche republic. The enforcer must not have a truce with the leading attacker. The enforcer must have at least +100 relations with the leading defender. The attacker must have -25% warscore or better. Enforce peace is a useful method for entering wars without triggering any automatic defensive call to arms from the opponent. For example, European powers outside the Holy Roman Empire can use enforce peace on empire members to enter wars against them without having to fight the Emperor. Enforce peace can also turn the tides against a rival's offensive war. Additionally, enforce peace may be used by an overlord to take command of a protectorate's offensive war, in which case the overlord becomes the leading attacker. Vassalization makes the target nation a subject nation of the country that offered it. Vassals are automatically called to their overlord's wars and pay a portion of their tax income. Breaking vassalization cancels a subject nation's vassalage and makes them independent. This action costs -25 prestige and -200 relations penalty with the former vassal, and results in a truce of 5 years with the former overlord. Vassalization cannot be cancelled when a truce exists with the target. Designating a vassal as a march grants it substantial military bonuses. Marches do not pay tax income to their overlord, and cannot be diplomatically annexed or peacefully released. 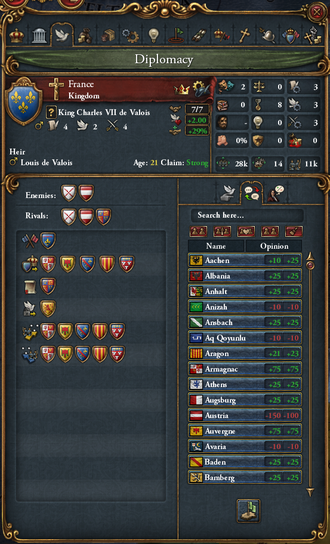 Revoking a march changes it to normal vassal status, allowing for it to be annexed. This action costs -1 stability and results in a -200 relations penalty with the subject. Diplomatic annexation incorporates a client state or vassal into the overlord's domain, resulting in direct control of the former subject's territory and military. This action occupies a diplomat for its duration and costs diplomatic power. Diplomatic integration incorporates a junior parter of a personal union into the senior partner's realm. Like diplomatic annexation of vassals and client states, completion results in control of the junior partner's territory and military, but also gains control of the junior partner's vassals, colonial nations, and protectorates. Diplomatic integration of a junior partner in a personal union follows nearly the same principles for requirements, cost, speed, and effects as diplomatic annexation of a vassal. Guaranteeing a nation calls the guarantor to war if the target nation is directly attacked by another nation. The guarantor will not be called to war if the guaranteed nation is called into another war as an ally, unless they are called in as a co-belligerent. The relation uses a diplomatic relations slot and lasts until revoked or a call to arms from the target is declined. A call to arms from a guarantee functions identically to a defensive call to arms in an alliance and carries the same penalties if declined. Guarantees can be revoked at will, which gives the former guarantor a truce on the formerly guaranteed country (but not vice versa). It is only possible to guarantee countries that are significantly weaker than the guarantor - protection from a weaker nation will not be taken seriously. Sending a warning to a target country results in a defensive call to arms if the target attacks one of the warner's neighbors. Rejecting this call to arms only incurs a penalty to trust with relevant nations. The list of neighbors for any nation can be found in its diplomacy tab by filtering its relation list to neighbors only. A country cannot warn another country it is already warned by, or that is not significantly weaker. A warning lasts for 20 years and can be issued again once it expires. Threaten war is a diplomatic action which lets a nation demand a province that it has a claim or core on. If the demand is accepted, the province is transferred to the demanding nation. If the demand is not accepted a war is declared with the Conquest casus belli for said province. War cannot be threatened over a country's capital (it cannot be targeted at an OPM) or if a truce exists with the target country, and nor can a subject nation (other than Tributaries) threaten war. Successfully demanding a province will cause the threatening country to gain aggressive expansion as if the province had be conquered in a peace deal and the target nation to lose -10 prestige. This also creates a 5-year truce between the two nations. A country will relinquish a province if the relative strength of the demanding country's alliance outweighs the relative worth of the province and the alliances of the threatened nation. The AI is more willing to give up provinces that the demanding country has a core on, and much less willing to give up provinces if that country has recently demanded another province. Improving relations sends a diplomat to the target country to improve relations over time. Relations can be improved up to +200 for subjects and up to +100 for all other nations. Improved relations decay by -3 on the first day of each year if there is no diplomat currently improving relations with the target country. The rate at which relations improve is highest when relations are 0, and decreases as the difference increases. This rate can be further improved by the improve relations modifier. Any bonus to the improve relations modifier also affects how fast any accumulated aggressive expansion will decay. When sending a diplomat to improve relations for the first time or when the improved relations value has decayed to 0 doubly improved opinion is gained on the first tick. The rest of the relations improvements take place at the end of each month. Sending an insult gives the target country the Diplomatic insult casus belli on the insulter for 1 year and lower relations by -50, decaying by +5 per year. Insults are useful for negating the -1 stability hit of declaring war on nations that have +100 relations of the aggressor. Insulting a rival also grants +5 power projection, decaying by -1 per year, provided that the insulter neither has a truce with them nor already has power projection from a previous insult. Countries ruled by monarchs may arrange royal marriages with others. This improves relations by +25 while in effect. Attacking a country with whom a nation has a royal marriage results in -1 stability and +1 war exhaustion. Note that this penalty will not occur except through a standard declaration of war; to circumvent it, the player may find it useful to Threaten War over a province that the target will refuse to cede. Upon the death of a Christian monarch with no heir, a ruler from the dynasty of a more prestigious country that shares a royal marriage may rise to the throne. If the countries already share a dynasty, a personal union may result instead. Personal union partners function militarily like vassals. They do not pay a portion of their tax income but may be inherited. Higher prestige increases chances of gaining the crown of a royal marriage partner for a country's dynasty, either independently or as a personal union. Royal marriages are unavailable to theocracies and republics, with the exception of the Dutch Republic. Christians may only marry other Christians. All non-Christians may marry each other, but personal unions will only occur for Christian nations. †: Distance between borders can only be seen in debug mode. Breaking royal ties ends a royal marriage. This results in -1 stability and -1 prestige. Furthermore, the relation with the target country is decreased by -75. The stability cost may be negated by completing Diplomatic ideas or being the Curia Controller. The death of the ruler who proposed the marriage will also end a royal marriage without penalty. Breaking royal marriages with rivals also does not incur a stability cost. Claiming a throne gives the "claim on throne" CB, a military means of forcing a personal union. -100 relations with the target country, and incur a loss of -20 prestige. Claimant gains "Claim on Throne" casus belli against the target. The war score cost to enforce a personal union is 84% regardless of the target's size. Note that while some allies may be willing to join a conquest war, they will not join a claim on throne war or succession war, due to opposition to a successful personal union. The gained casus belli lasts until the target country produces an heir with a strong claim or a new heir rises to the throne or the royal marriage is ended. The claim throne diplomatic action is only possible for Christian nations as no other religious group allows personal unions. While the Dutch republic, oligarchic republic, and elective monarchy can have royal marriages, their thrones cannot be claimed as they do not have heirs. Supporting an heir is an action that can be initiated on nations with an elective monarchy (which can only be gained by event for Poland and the Commonwealth, or by using a custom nation). Any nation that is in the same religious group as the country with elective monarchy can support an heir. The elective monarchy may also increase support for its own heir by 5 points at the cost of -10 prestige. Upon the death of the elective monarchy's ruler, the heir with the most support rises to the throne in the elective monarchy. If a local noble rises to the throne, the elective monarchy loses -20 relations with all countries that supported an heir in the election. Diplomats can be send to other nations to build up a spy network, or to practice counterespionage and increase the chance of catching spies sent by the target nation. When a spy network has grown enough, espionage actions can be undertaken, which do not require sending a diplomat. Most of the espionage actions require certain ideas from the espionage idea group in order to become available. Actions that do not need this group are fabricate claim, support rebels and justify trade conflict. Completing the espionage group will give access to various powerful actions. One example is the vetting idea, the first of the idea group, which grants a discount to technology cost depending on the difference in technology level between the home country of the spies and the target country, as well as the size of the spy network there. Covert actions are described in more detail on the Espionage page. Ask a target non-subject nation to transfer a percentage of its trade power to the proposer. While a transfer of trade power is active, the two nations involved cannot declare war on each other, and will also receive a mutual relation bonus of +20 per 100% of power transferred. The agreement does not count towards each country's diplomatic relations limit. Ask a target non-subject nation to use their merchants to steer trade toward the proposing nations trade capital. While a transfer of trade power is active, the two nations involved cannot declare war on each other, but unlike transfer trade power, there is no relations bonus. This effectively hi-jacks trade power in as many nodes as the target has merchants, where their merchants can be placed for the maximum benefit of the proposer. Technically, no trade power is transferred, so the values for each nation in each trade node remain the same, and if both share the same home node, then the target will still collect with their trade power, effectively wasting the value of the diplomatic agreement. The agreement does not count towards each country's diplomatic relations limit. Reduces the trade power of the target country in every trade node the embargoing country has trade power in, depending on several factors. Embargoing a rival grants power projection. Embargoing a non-rival gives a penalty to trade efficiency, but can give a net gain in trade power share (and hence income) if the other country is very dominant in an important node. Gives the other country +1 monthly progress in its capital area towards the oldest institution the sending country has embraced that the other one hasn't embraced. This costs 10% of the receiving country's monthly income and lasts for 10 years, or until all the sending country's institutions are present everywhere in the receiving country's capital area. This diplomatic option is not available for subject nations other than tributaries; only the overlord can share knowledge with them, and then only via the Knowledge Sharing subject interaction. The final value is rounded down to the nearest integer. The relation bonus will last for 5 years. Additional gifts sent during this time will have no effect unless it would increase relations more than previous gifts did. Allows a nation to loan out money to other countries for interest. When the loan is due to be repaid, the loan-taker can instead choose to keep the ducats. This will give the loan-giver a casus belli. Transfer a specified amount of money each month to the target country for a certain duration. The sender may transfer between 0.1 ducats and +50% of its monthly income to the target country each month, adjustable in increments of 1% of its monthly income. The duration of the subsidy can be set between 10 and 400 years, adjustable in increments of 10 years. All monthly income mentioned in this section refers to the monthly income as reported in the ledger. Be aware that the target country's total monthly income will therefore include this monthly subsidy once the ledger is updated after the establishment of the subsidy. This imposes significant diminishing returns on the relation benefits of a large subsidy, and encourages one to maintain smaller subsidies over a longer time frame instead. Example: Country A has a monthly income of 10 ducats, and country B provides it with a monthly subsidy of 5 ducats. The reported yearly relations boost will start at +6 per year (B's subsidy is 1/2 of A's income), then immediately drop to +4 per year after the first month (the subsidy is now 1/3 their income). Subsidies do not consume a diplomatic relations slot. This makes them a valuable tool for blandishing future targets of diplomatic vassalization or annexation. Subsidizing a nation at war with a rival grants power projection. A province can be sold to an another nation for a price of 0 to 2,000 ducats at a cost of -10 prestige. Both the buyer and seller must be at peace, and neither can be rivals of the other party. Only one province can change hands in a single transaction. The AI will only offer to sell isolated provinces, particularly if it is unable to core them. When the sell province button is clicked, the province to be sold can be chosen together with the price that will be asked for it. Additionally, it is not possible to sell a province to a colonial subject if the province is not in its colonial region. If the province is particularly undesirable to the buyer, then its base value and associated price modifier will both be halved. Selling provinces to a vassal is one method of saving administrative power by letting the vassal core the province. It is useful for avoiding overextension in the short term, and exchanges immediate administrative coring costs for diplomatic annexation costs later. The DLC enables giving provinces to vassals directly via the subject interactions interface, making selling provinces to them unnecessary. As AI nations place a very high priority on core creation, one can delay their research progress in administrative technologies by selling them provinces with a high coring cost. This can be particularly useful if the next administrative technology would otherwise unlock a troublesome idea group (e.g. AI Portugal's first idea group is always exploration). Navies can be sold to other nations for a price of 0 to 1000 ducats. If the target nation accepts the proposal, the fleet in question will transfer its allegiance to the buyer. In order to be able to sell ships to a nation, both sides have to be at peace and cannot be rivals of each other. After pressing the button, the fleet that is to be sold can be chosen together with the asking price. When offered to buy a fleet, the AI will want to hold on to a certain ratio of ships (for example, most countries on the Atlantic coast don't want to buy galleys) and will never go above their naval force limit. In order to be able to sell ships, the buyer has to have a fleet within supply range of the target nation. Fleets outside of the receiving country's supply range are not available to sell. The mouse-over on the YES/NO bar will give the factors for their decision (shown below), and if the fleet being offered is too large, it specifies how many less they desire, allowing the player to exit diplomacy and structure a fleet that meets the target countries desired profile. The AI will at times purchase obsolete ships. This makes it possible to get friends, allies, and subjects, as well as other non-rival countries to pay for upgrading the player nation's vessels when new models become available through advances in diplomatic technology. An aggressive nation may have trouble finding willing buyers and could potentially arm subsequent targets/victims, albeit with obsolete weapons. This allows a nation to ask another nation if they want to share the map of a region. If the nation accepts, the proposer will, at a cost of -15 prestige, discover all provinces that were not yet discovered in the specific region. The nation giving the map will receive 10. Nations can't be rivals of each other. In order to be able confirm the map exchange, the receiving nation has to have a unit stationed in a region adjacent to the specific region. This option allows a nation to purchase a province in a Trade Company region from another nation. Both nations must be at peace in order to negotiate the transaction. The player selects a non-capital province to purchase and moves the slider to increase the cash offered until the reasons to sell is one or more higher than the reasons not to sell. The more important the province to the owning nation the more reasons not to sell. Some of the factors are listed below. Request military access from the target country, allowing the requester's land armies to pass through its territories. Acceptance will raise the requester's opinion of the host country by +10, while rejection will decrease it by -10. Declaring war on a country that is granting the aggressor military access causes a major -5 hit to stability. Military access is shared for all participants in a war. For example, if France and Brittany are in a war against Burgundy and France requests military access from Savoy, then Brittany will also have military access to Savoy. Similarly Burgundy, and all of its war allies, would also gain military access to Savoy. Subject nations always give military access to their overlord. All participants in a war automatically grant military access to their allies, as well as being able to march into their enemies' territory. An army in non-allied land when war is declared, or in territory without military access when war ends, will be exiled. Offer military access to the target country, allowing their land armies to pass through the requester's territory. Acceptance will raise the target country's opinion of the requester by +10. AI nations are typically uninterested in obtaining military access unless they are the country's ally or subject, or the country is a large and sprawling empire. They will also seek access if they need to travel through a nation to fight in a war. Countries automatically gain military access to countries that grant military access to someone they are at war or allied with. A country can't revoke access to someone if they, or someone they are at war with, still has troops inside the country's borders. Naval supply range will now extend from the ports of that nation. Trading range will now extend from the ports of that nation. The requester may dock and repair ships in the ports of that nation. The requester may disembark ground troops in that nation by docking loaded transports at its ports. These land troops will not be exiled, and may move into any adjacent province that they would normally be able to enter. The base cost is 0.1 ducats per month per port, with a minimum of 0.5 ducats and maximum of 2.0 ducats. This fee is based on the amount of permanent ports. Non-city colony ports are usable and count toward the fee. Ports that reside in a province which are terra incognita to the receiving country also count toward the fee. Occupied ports only charge a fee if they can be docked at. The fee can be seen in the economy window under Harbor Fees. Fleet basing rights no longer extend colonial range as in past versions of the game. They can still be used to great advantage by distant fleets however. With El Dorado active, they are no longer useful to explorers since they no longer take attrition while exploring. Only nations that have diplomatic technology level 2 or higher can grant fleet basing rights. Once fleet basing rights have been obtained, AI nations will generally not revoke them unless there is a drastic change in relationship. Some diplomatic actions require control of the Curia and are also discussed on the papacy page. One of the diplomatic actions, call for crusade, allows the curia controller to call a crusade on a heathen nation. This will give every Christian nation bonuses if they are fighting in a war against the crusade target. The other action, excommunication, will grant every neighbor of the excommunicated ruler of a nation a free casus belli. The Emperor of the Holy Roman Empire has several special diplomatic options available. These action are each explained in more detail on the Holy Roman Empire page. Take on Foreign Debt – Pay off all the loans of the target independent non-great power country. Gives +10 relations bonus for every standard size loan of the target you clear, capped at +200, decaying -2/year Also grants +1 trust for every loan cleared, or +2 favours (if The Cossacks is enabled). Requires enough money to pay off target’s loans. Influence Nation – Pay 1 year of target income to increase relations and grant +1 monarch points in their weakest category for 10 years in a target non-great power nation. This raises their opinion of the great power by +25 for the 10 years, also gives +5 trust. Going to war with them cancels this bonus. Intervene in War – If there is an ongoing war between three or more great powers but an imbalance in the number of great powers involved on each side, you can make it your business to intervene. For example, if great power England is singlehandedly fighting the great powers of France and Spain, you as a great power Commonwealth can intervene on England's side to balance out the number of great powers involved. Break Alliance – This will force a nation to break its alliance with another. They will accept if the target nation is sufficiently afraid of the player and you will gain a truce with the nation you forced this upon. Useful for stripping the war target of pesky roadblocks. The former ally gets a "Forced ally to break alliance" CB against the great power for 10 years. Both the target country and the former ally get a -50 relations modifier with the great power. Note: nations who lose the status have access to the above actions for a grace period of 5 years. These actions are not in the main list, but are also conducted via the Diplomacy panel. The rival mechanic was added with patch 1.6. A nation is more likely to sign alliances with the enemies of their rivals. +25% prestige from defeating a rival in battle. No trade efficiency penalty from embargoing the rival. +25% spy network build rate against the rival. −33% Diplomatic Power cost for demanding unjustified provinces from the rival in peace deals. Having a rival and taking actions against it grants power projection. Not having enough rivals gives a penalty to power projection. Changing a rival is possible after 25 years for 100 diplomatic power. The cost to change a rival may be reduced by 50% with the ‘Flexible Rivalries’ ability during the ‘Age of Absolutism’. This releases a country as a vassal. The released country gets all of their core provinces that are owned by the releasing country, except for the releasing country's capital if applicable; the releasing country does not need to have cores on any of the provinces. Nations can only be released if at least one owned province is both a core of the nation and has its primary culture. This action can not be done while at war. Annex one or two provinces with cores of an extinct, but formerly large nation, and release that nation as a vassal. Then, you can slowly retake all their former land with the Reconquest CB, at no diplomatic point cost and only 25% of the Aggressive Expansion penalty. You should also do this if the nation is merely near death, but cannot be diplomatically vassalized for whatever reason. It causes more AE than forced vassalization, but the difference will not be significant if the country is small, and you will immediately have a vassal with low liberty desire and a good opinion of you, instead of large penalties from forced vassalization and aggressive expansion. Subsidize 3 different allies at least 50% of their monthly income without running a deficit. Successfully use Threaten War to gain a province from another nation. Secure a Royal Marriage with another country. ↑ See in /Europa Universalis IV/common/static_modifiers/00_static_modifiers.txt (Static modifiers#Base values).